Today, depending on the rapid advancement in technology and informatics, and the globalization, necessity for the increasing lifelong education requires change universities and various training programs. One of these programs, depending on the increase in the visual saturation, is undoubtedly the visual arts education, Today, in the context of the productions of contemporary art, changing aesthetic judgments, and social change, arts education, there is a need to rethink on the content of art education and art teacher education. Today’s artists are no longer engaged in more and more social issues. They more prefer the use of technology in the context of thought to explain. Contemporary art, interdisciplinary approaches are preferred. All media graphics such as film, photography, illustration, interactive networking, and motion blended with each other. New art forms have emerged from these mixtures. The difference between low and high art has obscured. Therefore, art educator must be a close follower of these changes. In this context, this study is based on two aims. In this study primarily was addressed the effects of postmodernism on art and art education. The primary aim of this research is to discuss the effects of postmodernism on art and art education. The other aim is to provide new recommendations for a new constitution about visual arts teacher education in Turkey in terms of the experienced changes in art education. Antmen, A. (2010). 20. Yüzyıl Sanatında Akımlar [Movements in 20th Century Art]. Üçüncü Baskı, İstanbul: Sel Yayıncılık. Anderson, T. (2003). Art education for life, Journal of Art and Design Education, 22(1), 58-66. Aykut, A. (2012). Sanat Eğitiminde Estetik [Aesthetics in Art Education], İstanbul: Hayalperest Yayınevi. Beyhan, C. (2011). Teknoloji ve sanat: Teknolojik gelişmelerin plastik sanatlar üzerindeki etkileri [Technology and art: the impact of technological developments on the plastic arts]. 1. International Art Symposium, (pp.131-140), (17 October 2011) Gazi Universty, Ankara. Clark, R. (1996). Art Education: Issues in Postmodernist Pedagogy, Reston, VA: National Art Education Association. Dewey, J. (2005). Art as Experience. New York: Perigee Book. Duncum, P. (2001). The theories and practices of visual culture in art education, Arts Education Policy Review, 105 (2) 19-25. Duncum, P. (2002). Theorizing everyday aesthetic experience with contemporary visual culture, Visual Arts Research, 28 (2), 4-15. Duncum, P. (2008). Thinking critically about critical thinking: Towards a post-critical’ dialogic pedagogy for popular visual culture, International Journal of Education though Art, 4 (3), 247. Eker, M. ve Seylan, A. (2005). Çağdas sanat eğitiminde sanatsal ve pedagojik postmodern montajlar [Artistic and pedagogical postmodern assemblies in the contemporary art education]. 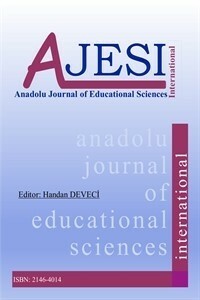 Eurasian Journal of Educational Research, 19, 164-178. Eker, M., Baltaci, H. ve Sengir, S.(2010). Görsel Kültür Eğitimi: Sistematik sanat egitiminden stratejik sanat eğitimine geçiş [Visual Culture Education: the transition from the systematic art education to the strategic art education]. 2. Ulusal Güzel Sanatlar Eğitimi Sempozyumu Bildiri Kitabı, (pp. 153-160), (8-10 Nisan 2010), Çanakkale: Onsekiz Mart University. Freedman, K. (1997). Visual art/virtual art: teaching technology for meaning, Art Education, 50 (4), 6-12. Freedman, K. (2003). Teaching visual culture: Curriculum, aesthetics, and the social life of art. New York: Teacher College Press. Garoian, C.R.(2013). The Prosthetic Pedagogy of Art: Embodied Research and Practice, Albany, New York: Sunny Press. Gaudelius, Y., Speirs, P.(2002). Contemporary Issues in art Education, New Jersey: Prentice Hall. Giroux, H. (2000). Impure acts: The practical politics of cultural studies, New York: Routledge. Gude, O. (2007). Postmodern Principles: In Search of a 21st century art education, Art Education, 57 (1), 6-14. Gude, O. (2007). Principles of possibility: Considerations for a 21st century art and culture curriculum, Art Education, 60 (1), 6-15. Keifer-Boyd, K., Amburgy, P., & Knight, W. (2003). Three approaches to teaching visual culture in K-12 school contexts. Art Education, 46 (2), 44-51. Keifer-Boyd, K. & Maitland-Gholson (2007). Engaging Visual Culture, Massachusetts: Davis Publications. Keifer-Boyd, K. (2009). CyberNet activist art pedagogy. In A. Arnold, A. Kuo, E. Delacruz & M. Parsons (Eds. ), G.L.O.B.A.L.I.Z.A.T.I.O.N, Art, and Education (pp. 126-134). Reston, VA: The National Art Education Association. Keifer-Boyd, K. (2010). Masquerading the immateriality of materiality. In R. W. Sweeny (Ed. ), Inter/sections/Inter/actions: Art Education in a Digital Visual Culture (pp. 170-181). Reston, VA: The National Art Education Association. Mc Laren, P. (2003). Critical pedagogy: A look at the major concepts, In A. Doder, & D. Torres (Ed) The critical Pedagogy Reader, (pp. 69-96), New York: Routledge Falmer. Mirzoeff, N. (1998). The Visual Culture Reader, New York: Routledge. Musneckiene, E. (2012). Trends in art education in the international context, In H. Sederholm (Ed), Art Beat (pp.141-171). Helsinki, Finland: Aalto University Publication. Soğancı, Ö. (2011). Türkiye’de görsel kültür: Uluslararası öğrenci kitlesine yönelik bir uygulama örneği [Visual culture in Turkey: an application example for the international students]. 1. Sanat ve Tasarım Eğitimi Sempozyumu Bildiri Kitabı (pp. 72-76) (27-29 Nisan 2011) Ankara: Baskent Universty. Stokrocki, M. (2006). Searching for meaning: visual culture from an anthropological perspective. Art Education, 59 (1), 46-52. Sturken, M., & Cartwright. L. (2009). Practices of looking: An introduction to visual culture, New York: Oxford University Press. Tavin, K. (2000). Teaching in and through visual culture. Journal of Multi-cultural and Cross-cultural Research in Art Education, 18, 37-40. Tavin, K. (2002). Engaging advertisements: Looking for meaning in and through art education. Visual Arts Research, 28 (2), 38-47. Tavin, K. (2003). A critical pedagogy of visual culture as art education: Toward a performative inter/textual practice. Unpublished Doctoral Dissertation. The Pennylvania State University, USA. Tavin, K. (2004). If you see something, say something: visual events at the visual culture gathering. Visual Arts Research, 32 (2), 2-6. Taylor, P. (2009). Madonna and hypertext: Liberatory learning in art education, Studies in Art Education, 41 (4), 347-389. Tillander, M. (2011). Creativity, technology, art and pedagogical practices, Art Education, 64 (1), 40-46. Varto, J. (2012). Contemporary art and art education: strategies and dead ends, In H. Sederholm (Ed), Art Beat (pp.67-84). Helsinki, Finland: Aalto University Publication. Yılmaz, S. (2010). Görsel sanatlar eğitiminde çağdas yaklaşımlar [Contemporary trends in visual arts education]. 2. Ulusal Güzel Sanatlar Eğitimi Sempozyumu Bildiri Kitabı (pp. 183-186) (8-10 Nisan 2010), Çanakkale: Onsekiz Mart University.